The Year of the Earth Pig 己 亥, is going to be a very special one. It is the year of the major transition. Let us imagine, how 己 Ji (Yin Earth) and 亥 Hai (Yin Water) look like, when these two elements come together. Earth + Water = mud. Given that 亥 Hai is containing two hidden Yang Stems 甲 Jia and 壬 Ren, the inner quality of 亥 Hai earthly branch is strength and fast motion. This is the reason why we equate 己 亥 Ji Hai not only to mud or muddy water, but also the dirty water running fast. After it subsides, the Earth becomes more fertile, giving birth to new life. What this means for us is that this is the time where the new beginnings originate from. If you’re the one who likes breaking the rules, this is your time. Come forward and make yourself known. Plant your seeds now to reap the rewards. For those of us who like to abide, wait till the murky waters subside a bit, because standing on the way is not a good idea. Unless you know how to go with the flow. If you thought of making changes to your life or career, this is a good time. You will notice that you are not alone. Many of us will be prompted to make changes. People will travel. At times, it will seem like the whole world has taken off. Symbolically, it has. And it is not going to settle until we are well into 2020. 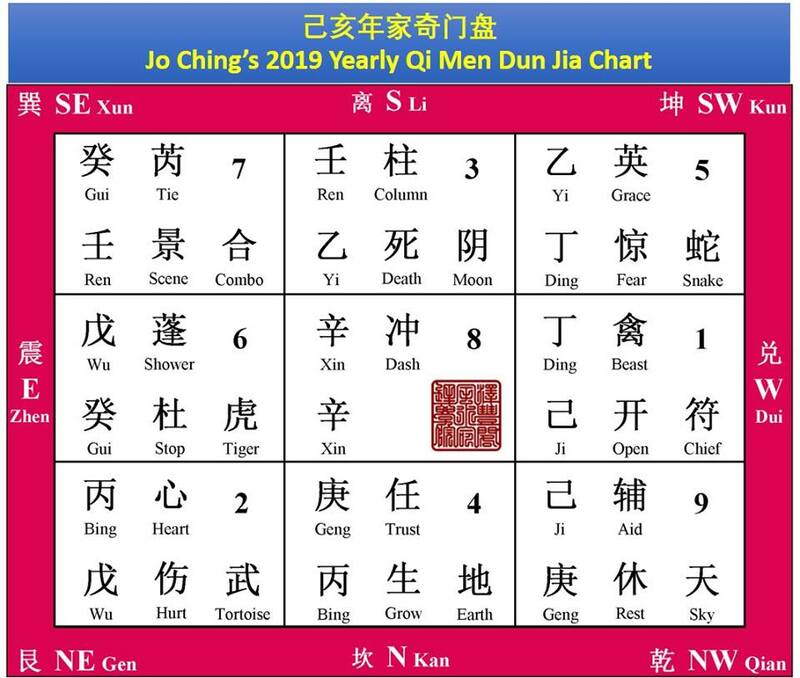 For this forecast we are using Qi Men Dun Jia annual chart system. It is a system where Heavenly Stems have a special importance. 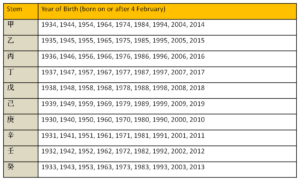 Hence, we are looking at the yearly stem that you are born with, rather than the 12 earthly branches or zodiacs for our annual luck analysis. In Liu Bo Wen QMDJ Divination we take into account not only the components found in each palace, but also the hexagrams deriving from the combination of the components. So, do scroll down further to find out how will 2019 pan out for you. Now that you have found your stem, let us see if you are the one who is going to have much fun riding the Earth Pig. In our annual chart 甲 Jia Wood is represented by 辛 Xin Metal. This means that for instance, if you are born on or after 4 February 1984 or 2004, you belong to Jia Wood yearly stem. However, Jia Wood does not appear in a typical Qi Men Dun Jia chart. So, you have to substitute it with Xin Metal. Given its positioning in the middle of the chart, we may conclude that the people whose year stems are Jia and Xin are likely to be under lots of pressure. They may feel trapped and frustrated, but how else can one learn to break through the barriers if there are none? This is a perfect time to build up your inner strength and wisdom. Swift action will be required later this year when the obstacles start crumbling away. This hexagram looks like an open jaw. On the one hand, it is about nourishment to build up strength. On the other, one needs to be careful to stay away from danger. In symbolic sense, ‘not to be eaten’. It is wise to be careful with words as well. 乙 Yi Wood is one of the luckiest stems this year, who will enjoy the Nobleman luck. You are particularly attractive this year to their potential partners, and you may need to put on your best stilettoes for the show, whether you like it or not. You have been known for your gentle and pleasant nature, but this is not what will get you over the line. To receive the medal, you need to show your strength, character and ingenuity. There is no need to stress, no matter what comes your way, the Noblemen will be there to assist you. Whenever you face opposition, use the rational approach. Being logical and pleasant is your winning strategy. 丙 Bing Fire will also have a great year. For them, this is the time to shine! Prepare for smooth sailing, attracting the opportunities, and the good fortune. All wishes come true. Anything you set to achieve in work or studying is achievable. However, in case of an extra marital affair, things may not go according to plan, just be aware of the potential consequences. Behaving according to proper principles will prevent undesirable situations. 丁Ding Fire people will rise in status due to auspicious people luck. Ladies will get help from their husbands and male bosses. This is an excellent time to take advantage of the new career opportunities or starting a new job. Establishing a career or a good reputation will be easy. The Nobleman luck is on your side. If you have not discovered your true calling yet, this is highly likely to happen. You could be surprised how many talents you have! Agreement between the parties leads to a good fortune and harmony. Small effort big rewards. 戊 Wu Earth may feel unsettled this year. This is a pay-back time. This is the time to re-examine your current situation at work and at home. 戊 Wu in Zhen is under penalty, which could translate into weakening health, wealth loss or legal problems. The health issues are likely to be related to contamination of food or drinks. As for the legal problems, they are likely to be related to mistakes in the financial documents. So, it is a good idea to check your books before the authorities do. It may feel like the life is full of obstacles, and the movement forward is challenging. Take it as a blessing in disguise, because this is also a very special time of reflecting upon your past and drawing important conclusions. To improve your luck, you may consider sorting out the baggage of past relationships and paying your debts. Clean water is the source of life. Clarity and transparency in conduct is beneficial for all. 己 Ji Earth will have an emotionally rewarding year. You will be surprised how easy it is to manage the complex projects. You will enjoy the support of your colleagues. Both, the superiors and the subordinates will think highly of you. Business and leisure trips will create a sense of adventure and happiness. Travelling to exotic locations and pursuing unconventional interests will make this year unforgettable. Spring disperses the winter frost. The ice melts away. The good news and blessings are on the way. 庚 Geng Metal is known for its decisiveness and the will to act. This year, however, you may feel like going against the flow. All the important matters are placed on hold, and you will have to learn that, you are not always the one in charge. At the same time, there will be some wealth opportunities coming your way. If you choose to invest this year, make sure you take an expert advice. At home, you will enjoy harmonious relationship. If you are not married, the intimacy and romance will be easy to attract. It is quite likely that your love life will be eventful this year. The image of stillness. The time to clear the path rather than expand. 壬 Ren Water will have to deal with the serious matters from the past. Things which were hidden for some time, will now come to light, creating an undesirable situation. Confrontation is not a solution. Try to keep an open mind. Embrace other people’s point of view and their circumstances, so that you can understand where they are coming from. Be transparent about your intentions to avoid being blamed for somebody else’s mistakes. This is the time for creating unity. Extra care needs to be taken when driving or using the sharp objects to prevent injuries. People gather and rejoice. Good communication. The time to share the common goals. Strength from moving towards a single purpose. 癸 Gui Water may find themselves dealing with the problems from the past. Addressing these is long overdue. You may find yourself in a hot seat. Try to focus on improving the relationship with people around you. This will be easier than you think, as the people luck is on your side. At the same time, you need to be careful with words, to prevent gossip. Guard your personal information to prevent the information theft. Learning the new unconventional things will give you a sense of confidence, paving the path for the future. The Sun has descended, dark and dangerous. Future is unclear. Hold back and restore your energy. As we can see, not everybody is going to have a smooth ride, but we can confidently say that this year is not going to be boring. It will move at such a great speed, that we will hardly notice when it is over. Enjoy the ride! Wishing everybody to have a healthy and prosperous year ahead. Gong Xi Fa Cai!